The two disc Deluxe includes the ‘Detroit Mix’, a fascinating alternative version of the entire album, which, as it says on the can, was mixed in Detroit, but never made in onto vinyl – a subsequent mix done in Los Angeles the following month, being the one released (and what we’ll be listening to on Sunday). Amongst the other extras there’s the wonderful ‘Rhythm & Strings’ mix of the title track, which some of you might have heard me play out, and a live presentation of the album (plus a medley of Marvin’s ’60s hits) from Washington D.C. in 1972 – this was the first time he’d performed live in a number of years. I honestly can’t think of a better way you could spend a tenner- this is value for money to the max! I hope you’ll join us this Sunday for the inaugural Living To Music session. I’ll be driving back from Dorset, where I’m appearing at Camp Bestival the previous night, to listen at home. You might have never heard ‘What’s Going On’ before, or, like myself, you may have heard it countless times, but that doesn’t matter – what does is that you set aside any previous experience with this album and listen, purely, to a great artist at his most inspired and inspirational. After you’ve listened to the album it’d be great if you could leave a comment here sharing your impressions – how the music affected you, who you listened to it with, where you were, plus anything else relevant to your own individual / collective experience. Really excited for this! Love the idea, and i’ve managed to rally a big group of friends from work to all come round an participate. We’ll be kicking off a little early, being 9 o clock australian time but still very excited! Just listened to it again, how good does Inner City Blues sound!? Great idea. What is going to be the next one? I listened alone in the spare room with no distractions. I was initially quite angry due to other issues but when Marvin’s golden tones washed over me that anger soon dissapated. There is an incredible warmth to this album and there seems to be a lot to take in which warrants repeat listening. This is a great idea and one that I hope will be repeated. I think I’m as guilty as everyone else when it comes to distracted listening so it made a nice change to really focus on a piece of music. More later, but initial feeling was one of love and gratitude to Marvin Gaye for just living on this earth. Experience shared with family and friends and, almost two hours on, still left with the warmth of sensation from listening. Can’t help but coming over all hippie, so peace and love to all. So I listened to the whole album tonight, and would like to get some thoughts down. Sorry its a bit of a barin dump, and I might miss a few things I wanted to say. I went into this being guilty of not only distracted listening, but very rarely sitting and listening to an album as a piece of art – or how the artist intended. I guess its always my intentions to listen to music how I intend to, which is usually quite random…spurious…un-connected. Few and far between are the times when I want to listen to one artist for a set period…and for whatever reason, be it right or wrong, I dont usually find much comfort in doing so. Wether or not I find the artist fascinating. It could be the long history of “social enjoyment” has shortened my attention span, or it could be I dont like being forced down a path. Whichever it is, its something that even as a music lover, is not really a part of my life. With this in mind, I did not have high hopes for how I would feel…but I intentionally put any prejudice to one side, and vowed to listen to the album not just from the point of view of how it is musically (the thing that excites me most about tracks) – but also what message it gives, and how it is constructed as a whole (the thing that usually un-excites me about tracks). My first impressions were not spectacular. I love the opening track through familiarity as much as anything (something that alot of people like music for but are loathe to admit) – but then the message in the songs started to take over and I found myself unable to connect. I am not a spiritual person – in fact, I could probably be called the opposite. I see Soul music as a term for a type of music I like, rather than a form of music that touches my soul as I dont believe there is such a thing. So I found the religious connotations of the album hard to…well..id say acknowledge but really stomach may be a better phrase. I found it difficult to hear the words of a singer sending a message out about Vietnam, when it was clear at this time he had none of the real difficulties in his life that the people who were out there faced. I guess a cynical part of me questioned if there was a commercial aspect to this – although writing songs about the negativity of war might not connect with aspects of the communities of the time, it would ring true with many others (especially..i assume…large portions of black america). The song I particularly disliked is Save The Children. Although I agree with its sentiment, the things I know about Marvin Gaye’s life made me, sadly, look straight through it. A real melancholy ballad that only needed a childrens choir singing in it to top it off. That may seem a little harsh but I found it pretty cringeworthy. It really dampened the whole experience of the first part of the album. As much as I had to listen to Marvin singing about god – and knowing he was both a womaniser and a drug addict this smacked of hypocrisy – I found this track to be the lowest point that I experienced. I thought about what i might write, but tried to clear that out of my mind because I had more than half the album to go. I could say luckily, but I dont think it was luck….the album as a whole changed both musically and in tone of delivery (but perhaps not message) for the second half. A really poignant point for me is at the end of track 5…God Is Love Marvin says ‘all he asks of us” – track 6 starts immediately and comes in with “mercy mercy me”. All he asks for is Mercy. i didn’t even realise the track had changed…or I wouldn’t have, if I didn’t know Mercy Mercy me so well. I might not believe in God but I do believe in Mercy, as its a power all humans have should they wish to use it. I really liked that. The track that stood out the most as a piece of music then kicked in. Right on is a piece I must have heard as my mother used to play it…I half recognised it but I hadn’t ever seen its beauty before. For the first time I stopped listening to the words, and listened to the rhythms. I mean, Marvins voice and command of tempo and harmony is absolutely superb on every track…even the ones I might not have fully enjoyed, but this appealed on every level. The rest of the album, for whatever reason, I took more of the message in – and it put the first half into context better. Marvin starts to sing about Poverty and people, things that i can connect with because as someone with a scientific nature, I see these things every day and can acknowledge them as real. This might sound closed off to some (narrow minded perhaps), but its just my way. On the whole, I enjoyed this experience. I also enjoyed the album, having a fear at first that i might not. I will of course listen to it again, and probably again…and again…and more things will sink in, and I will read more about Marvins life, and more things will make sense. I didn’t need to know that Marvin was a gifted artist – the world knows this. I didn’t need to know if people would consider this a classic album – the world says it is. But I needed to know if I though of it as a classic. I guess the answer is no. Classic parts, but not a classic as a whole. Maybe that will change with time. Thanks for the idea Greg & nice to read everyone’s thoughts through the comments above. Some records be it in the bag/box, in the crates or on the shelves imprint themselves – a marker, a time a space & place…..I can still remember being given my copy by my dear Bro’ (many moons ago) & the first listen…I loved it and still do…the way the tracks continue into one another pretty seamlessy does make the composite whole of the LP in one-go make more sense. That isn’t say that certain songs dont stand on their own as clearly they do – I never tire of listening to Inner City Blues & check the Impressions version on buddah – heavy!! I think in “What’s Going On” its a case of a musician songwriter managing to capture their personal emotions both in the lyrical content & vocal/musical performance on tape thereor at least it feels that way for me. Listen to “what’s happening brother” thrown in the blender by UK Hip-Hop act Caveman & the emotion is still there without Marvin’ lyrics. A protest LP of sorts, with more q’s than a’s if you really wanted to challenge the socio-political message contained in the grooves.I think the Vietnam angle comes from his brother being out there as a G.I. and penning it for him rather than any commercial black power/anti-war dollar. In fact wasn’t it the opposite here with a real struggle to get the studio time in the first place and release approved by Berry Gordy of Motown. He still wanted the hit formula that he’d perfected to continue…but times were changing. The first thing that struck me was your comment that “…he had none of the real difficulties in his life that the people who were out there faced” regarding the album’s message about war in Vietnam. The thing is, the whole concept of the album came about because his brother was fighting in Vietnam, and it was his genuine fear for his brother’s safety and his understanding of the true horror of what was going on from first hand stories he was hearing that inspired him. As for the religious message.. Marvin was a screwed up guy – his womanising and drug addiction were sources of extreme guilt, and his entire life was filled with confusion over this very thing. I don’t see that being “a sinner” makes his religious beliefs any less significant. Finally, the idea that the album’s message was for any kind of commercial reason.. Before What’s Going On Motown was an out and out pop label, no record was released without a panel listening and deciding it was going to be a hit. There was no question of integrity, no artistic values, Motown was simply a hit making machine. Marvin recorded this album pretty much against Motown’s wishes and fought to have it released after it was rejected. He refused to perform or record until the album was released and eventually Motown relented. He had plenty of commercially successful albums behind him, which was something that always bothered him at Motown. What’s Going On was recorded partly because of his unhappiness at having to release records Motown told him to release for nothing more than commercial reasons. yep – I now know some of the things you put in your post – in fact I did at the end of the listen of the album (when I spoke to Greg on the phone) but I wanted to comment on what i heard and knew myself…which was very little. Obviously knowing that Marvins dad was a cross dressing preacher, and his brother was in the vietnam war for three years, puts much more of the album into context. When I listened to it last night, I didn’t know these things. My knowledge of Marvin Gaye is criminally insufficient – so I made assumptions – although I did know Marvin was not in the war himself. I didnt want to go and do the quick bite size check in Wikipedia (but I have done so since). Im happy that i was wrong in certain cases as it takes away some of the negativity I might have felt initially. When i used the term commercial – I didnt really mean in the sense of a commerical Motown hit – although I still think that basing an album around something that was such in peoples minds at the time could have an aspect of that…I read something that says that Barry Gordy was in no way against the political connotations of the album…more the structure of it with songs leading straight into each other. That could be misinformation I suppose, but I cant see how the overseer of the greatest hit machine of all time could not see the money making aspects of this. I’ll move on though, as its not a strong feeling I had, and I dont want to take away from the artist. What I have decided to do now, after listening (properly), is find out more about Marvin Gaye the person, and then re-listen to the album and perhaps pass comment again, with a better understanding. I stand by my initial impressions apart from the uninformed assumptions…I was pretty sure if I got anything wrong then more enlightened people would help me out with that. I guess its a really good thing that this will now push me to learn more about Marvin, and of course the funk brothers. I ordered two more Marvin Gaye albums last night (two I dont have and have never heard) and Standing in the Shadows of Motown, to give me a fuller picture. I also would really like to read a book – a biography maybe, but I wouldnt know which to choose so maybe some on here could help me out. I suppose as someone who loves music i should be ashamed of myself for not knowing enough about one of the greatest of all time – but I am not really. I knew I would get around to him in the end, and now is as good a time as any. “Divided Soul” by David Ritz is a very good book if you want to try to understand Marvin. There’s no shame at all in not knowing “enough” about a certain artist – I only picked up on your comments because I’m a massive fan of Marvin Gaye. If you’d made similar comments about Stevie Wonder for example, I wouldn’t know if they were correct or not. I’m pretty certain Berry Gordy had issues with the album’s message btw. Motown wasn’t about music with a message. Hi all. Three friends and I listened to the album on CD, on the M6 – on our way back to Manchester after a weekend chilling in the Lake District. The soundtrack to our journey home was an enjoyable experience made more special by the changing scenery, rolling hills and moody, heavy clouds caught by the 9pm sunset. Very atmospheric! I’ve had this album on MP3 for a number of years, although I’ve never listened to it properly, having plucked several of the tracks out purely for DJing purposes, and discarding the few that I simply didn’t need or want. (A necessary evil of today’s digital DJ? & proof that digital music can be very disposable!.) So I was looking forward to listening to Marvin’s work with more respect for the whole. I wasn’t disappointed. Aided by our Punto’s Pioneer parcel shelf, the music was all consuming! For me, the basslines and soaring strings combined, of course, with Marvin’s pleading tones to create an emotional musical landscape and journey. My friends enjoyed the music too. We discussed it briefly afterwards, noting that the album seemed short and sweet. But that the messages within where strong and powerfully delivered. We also discussed what we knew of the Vietnam conflict. And that the album helps document a moment in time that was very turbulent. Interesting to read from the comments above that Marvin’s brother fought in Vietnam! A lot more makes sense now! On a lighter note, the end of ‘Right On’ raised discussion about the exploits of jazz flute phenomenon – Ron Burgundy. As well as memories of the ‘wooden shark’ (Guiro) musical instrument from our school days, the rasping of which I find too distracting, typically on ‘Right On’. I also I agree with Cosmic Boogie that I found ‘Save The Children’, in particular the repeated line “Save the babies” a little uncomfortable. On the whole this Living To Music experience was satisfying on several levels. It rounded off a top weekend, and I enjoyed listening knowing that other people around the world where too. As a child I’d often listen to a tape on my walkman, wondering who is also listening to this right now? where they might be, and what they might be doing? On reflection, this exercise has made me value the album format more. I’ll certainly be looking out for a vinyl copy of ‘What’s Going On’, and no doubt the other albums that will feature through Living To Music. As a DJ I’ve fallen into a habit of dismantling albums and categorising individual tracks under my own Serato crates. Now I’ve tapped back into my pre DJ days of listening to entire Pink Floyd albums etc. I think I’ll now start working my way through my vinyl collection and moving the LPs from my decks room to the LIVING room. As someone whose stylus never gets time to warm up on an LP, my penchant being for 12” and the odd 7” single, I was a little apprehensive about subjecting myself to an LP length listen. I am used to marathon long sessions of listening to 12” discs – mainly listening for crackles or pops or the dreaded jump – with regular trips over to the turntable to lovingly brush, anti-static trigger, and replace ever so carefully the 12” back into its protective sleeves again. But a full LP – not sure ! I tried to remember what the printed sheet that I had prior to today’s listening said – Greg wanted us to listen on Sunday, oops that diary entry never worked!- and be solely involved with the music, no distractions – that was easy to arrange. But the LP sleeve wasn’t the most enticing looking artwork I had seen, Yes I heard it was a classic-whatever that meant, but really could I sit through every track all the way through the LP. I doubted it. With just a cursory glance at the song titles, 6 or 7 on side one, and three long tracks on side two, totally ignoring the sleeve notes in case my thinking was ‘contaminated’, and resisting the urge to get the AMG Soul Music Guide book off the shelf and read what I was about to ‘think’ I put the needle to the record and sat back- a virgin of the purest kind. What struck me first was the voice and the way the vocals are up front on the first track. Probably the only track I can remember hearing before, and really liking it. There seemed to be good stereo and layering of the individual tracks, a good mix if that’s the right expression. The second track was a bit odd as Marvin’s voice was in a lower register and it threw me for a bit, but again a nice melodic sound, obviously really good musicians on this LP. Track three was a bit ‘out there’ something that would be enjoyed whilst tripping I would imagine, and again the musicianship caught my ear. The next three tracks similarly held me. The LP seemed to be changing styles all the way through the first half, and now seemed to be in a Gospel style,. I am not one for listening to the lyrics anyway, but I was aware of the ‘messages’ that were interwoven with the good bass lines and the nagging Congas/Bongos in my left sphere. There was even a hint of mixing going on when the later tracks blended into the next. The first side ended and whilst not gripped with the usual high adrenalin I get from my Dance 12”, I was happy enough to know that when I purchased this LP from Ebay in the States a few years back, because it was a ’must have classic’, I would enjoy the first proper listen. The Side two looked more exciting to me now I knew that it wasn’t a miserable, Sixties Motown tinny-type assault – which most Sixties tracks seem to be to my ears. And there were only three tracks and they were Longer, I settled back and listened. Again the great musicianship was evident, and now to me the style had evolved into something that would appeal to the listener that I thought it was aimed at with its percussion and general grove. There now seemed to be a preachy type sermon being served up – if the first side didn’t wake your political consciousness then this side would try a more subtle way. Again two good tracks, but it was the third which really caught me- what a great (bass) guitar track…I loved this track the most out of all the album, and it seemed that Marvin had performed the text book description of Start with a Good ‘un, end with a good ‘un, and leave them wanting more. Towards the end of the last track Marvin was singing ‘Mother’ and I was struck how similar it seemed to be to John Lennon’s’ Mother sound on the Plastic Ono band LP I had watched a programme about on the excellent BBC Four a few weeks earlier. I was even more surprised when the track speeded up and seemed to have a Beatles sound for a few moments before settling into a percussion and fade ending which made you want the sound to pick up again and really go on a long jam…. First time I have listened to an LP in ages, and it probably shows to you regulars. First time I have listened to this LP, and I enjoyed the experience so much that I could become a regular in Greg’s mad experiment to conquer the world through LPs. First time writing a piece like this about an LP, hope I haven’t sounded like an arse. These are my honest views after one listen. I am sure with repeated listening I will get the underlying message and angst of the times, and any political and social context that the music was ‘apparently’ meant to portray. But for now I am just happy that even though I was a day late in joining the 17 or so who bothered to write up their own thoughts I did it and would not be put off by Greg proposing another LP , even with (in my view) not the most enticing artwork on the sleeve. Really bowled over that so many people got involved – the response has been more than I could have hoped for. It certainly confirms that, with a bit of application, the experience of truly listening to music is still as rewarding as it ever was – the next session will be announced soon. It’s great to share peoples’ impressions and perspective, we all come in from different angles but connect together via the collective experience. This is such a unifying process – it’s no wonder that the 60’s seekers placed such importance on communal listening. I’d forgotten that ‘What’s Going On’ was only 35 minutes long, which wasn’t unusual for an LP back then. Since the introduction of CD’s in the 80’s, albums have got longer, given that a CD can hold much more information than a vinyl LP (many recordings originally issued as double albums fit easily onto a single CD). Maybe, given the extra space available, there’s far more fillers that have made it onto albums in the past 20 years than you might have found in the previous 20, when they probably would have been shelved as outtakes (often to emerge later down the line as ‘bonus tracks’ on CD re-issues). I suppose it stands to reason that, as a consequence, the overall album format has suffered – for example, if somebody nowadays made an album with the depth and substance of a ‘What’s Going On’, the record company would be sending the artist back into the studio to ‘finish it off’ if the running time was 35 minutes. Sometimes, as illustrated here, less is most definitely more. 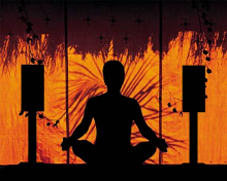 Sitting down to just listen has a meditative aspect – stilling your body and, if possible, your mind, to absorb the music. Given the context of the album we were listening to, I figured that for some of the people participating it would perhaps touch the spirit, so to speak, and the fact it was a Sunday only added to this impression. The album is undoubtedly one of the most spiritual recordings of the popular music era and, if you know anything about Marvin Gaye’s life and death, it’s impossible not to take this into consideration. Sometimes I can’t help but well up when I hear the line ‘don’t go and talk about my father’ in the track ‘God Is Love’ – on one level you can take it to mean God the Father, but on another you know he’s also referring to his own father, who was at the core of his troubled life and, as fate would have it, abruptly took it away in 1984 when he shot his son dead. His father, of course, was a church minister – religion being central to what made Marvin Gaye into the person he was, and the tortured artist who created ‘What’s Going On’. As you can gather, this is a very tangled web. If you want to find out more, books include, as Al Kent earlier suggested, David Ritz’s ‘Divided Soul’ and Michael Eric Dyson’s ‘Mercy Mercy Me – The Art, Loves & Demons of Marvin Gaye’. As a result of Living To Music I’ve learnt that there’s a book that was published in the US, which focuses specifically on the album, ‘Marvin Gaye: What’s Going On and the Last Days of the Motown Sound’ – needless to say I’ve ordered myself a copy and eagerly await its arrival. There have also been some great TV documentaries, the most notable ones I’ve seen have been Arena’s ‘Trouble Man’ and another BBC production, ‘What’s Going On – The Life And Death Of Marvin Gaye’, which is available on DVD. All in all I feel that this was the only way we could have properly launched Living To Music and, even if you weren’t able to join in the session, I implore you to buy a copy of this extraordinary album if you don’t already own one. Forgot to mention ‘Standing In The Shadows Of Motown’, the documentary about The Funk Brothers that was mentioned earlier, and which is available on DVD. The Funk Brothers were the Motown studio musicians who played, un-credited, on the majority of the many Motown hits of the 60’s, which we all know and love. ‘What’s Going On’ was the first record that credited them. The Funk Brothers obviously played a big part in the album we listened to, not to mention the course of popular music in general. Really enjoyed the opportunity to enjoy my first time listen on an excellent sound system. I loved feeling the rhythms and totally immersing in his beautiful voice. I knew hardly anything about Marvin except the “bad stuff” and it really moved me to listen carefully to the lyrics. Listened again in work tonight and heard more of the backing this time. Can’t get over the drumming and percussion – seems like pure genius to me. Thanks for starting this up Greg. I have to say, part of the buzz for me was knowing there were other people doing exactly the same thing all over the world. In the summer of 2005, I spent a memorable evening with friend and DJ, Neil Meekin, listening to some of our favourite recordings. The event was informal and spontaneous; we each picked a handful of records, poured some drinks, and took turns in playing each other our selections, explaining the personal significance of each song. Standout tracks were Leroy Hutson’s ‘Lucky Fellow’, Don Blackman’s ‘Heart’s Desire’ and Eddie Harris’ ‘It’s Alright Now’. We had both recently discovered the Natural High compilations: ‘2-Step Soul, Boogie Fusion and Rare Groove from the Vaults of Atlantic, Elektra and Warner Bros. Records 1974 – 1982’, and these albums inspired much of the listening that night. Noticing how immersing ourselves in each song, without distraction, enhanced the listening experience, we planned to repeat the event with more mutual friends. We called these gatherings our ‘rare groove sessions’ and spent many evenings that summer ‘living to music’. When Greg published his post on 27th June 2010, I was reminded of our late night listening sessions and eagerly awaited the first instalment of this wonderful experiment. 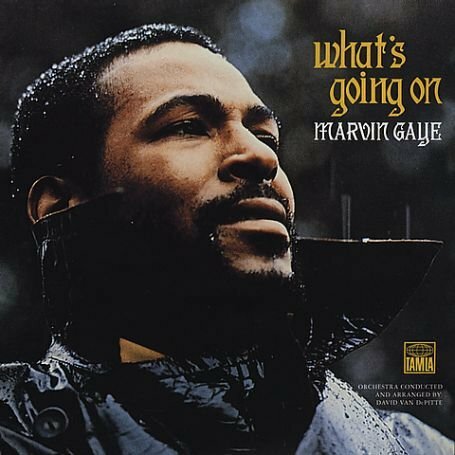 Marvin Gaye’s ‘What’s Going On’ seemed like the perfect first choice, and I realised the personal significance as Greg had previously borrowed the title of this album for the information sheet he handed out at his DJ gigs at Legend and Wigan Pier in 1981. As a DJ, I was brought up buying 12” singles, and the idea of listening to an album in full didn’t cross my mind for many years. In 2006, I was listening to Jill Scott’s 12” single, ‘Golden’, and my girlfriend at the time asked me what I thought of the debut album, ‘Who Is Jill Scott?’. Astonished that I’d never heard it in full, she gave me her own copy on CD, and I remember being stunned after my first listen. I knew every word to the singles ‘Gettin’ In The Way’ and ‘A Long Walk’, but hearing these songs in the context of a whole album gave a new depth to the music. I fell in love with the LP format and spent months exploring the host albums of my favourite tracks. Today, I buy more albums than singles, and will rarely sit down at the turntable unless I know I have the time set aside to listen in full. Today I find it easier than ever to fill my time with distraction, stimulation and general busyness, and the seemingly simple act of setting aside time to focus my attention on just one thing can be quite profound. Sitting quietly in Greg’s front room, lights dimmed, drinking a lemon and ginger tea, I was intensely present as the album started playing at 9pm last night. Whenever I caught my thoughts drifting, or whenever I began to analyse what I was hearing, I gently refocused my attention on the present moment, feeling the expansiveness of Marvin Gaye’s masterpiece in this deeply receptive, meditative state. I realised that listening actively is a highly creative and inspiring practice, and I likened my experience to what Terence McKenna calls ‘the felt presence of direct experience. The nexus of space and time, where you are now, is the most immediate sector of your universe.’ To share such a moving experience with friends, was, for me, the highlight of the evening. And the songs themselves? Whenever I hear the album’s title track, I’m reminded of the first time I heard Liverpool DJ Robin Jackson choose it as the last song of the night. Hearing such an emotive song being played on a club sound system for the first time is one of my treasured musical memories. Last night, listening to the song in the context of the whole album gave Marvin Gaye’s message a renewed poignancy, and I noticed how relevant his lyrical message still is today. The transitions between tracks are beautifully placed, and I agreed with Che when we shared our thoughts later that although each song has its own lyrical message, the unifying theme of love is most inspiring. For me, this is also ‘living to music’ and is just as nourishing as the experience we shared last night. I hope that session was the first of many, and I thank Greg wholeheartedly for encouraging me and reminding me to truly appreciate the message in the music. The book I mentioned arrived this morning – now there’s service for you (only ordered yesterday afternoon). Turns out it’s actually a UK publication (but with an American author) and part of the Mojo Heroes series. Completely missed this when it was published in 2001, so it’s a great, albeit somewhat belated, discovery. I thought the idea behind Living to Music was an interesting one, but like many, was unsure I’d be able to set aside time to listen to an album in it’s entirety, without distractions or interruptions. I cleared previous commitments to do just that, and it was for me, a different way to experience music. In my younger days, I would happily sift through mountains of vinyl, sat in dusty record shops/ second hand outlets skimming through album after album in the search of that one killer track, or hitherto overlooked hidden gem. Actually listening to ‘What’s Going On’ from start to finish certainly gave a different perspective. An album that contains 3 stone cold classics is rare indeed, and the reason that ‘What’s Going On’, ‘Mercy Me’ & ‘Inner City Blues’ are the better known tracks from the album is because the tower head and shoulder above the other songs; outstanding in terms of message, musicality and MG’s vocal delivery. The other tracks, whilst similar in theme, pale by comparison simply as those 3 tracks are so good, hence the reason they and the album in question have stood the test of time. When you then start to think of how the album came together, to coral a whole band and their various moods and ego’s to get together in the first place, collaborate to the extent Gaye would have required them to, the cost and logistics of such a pooling of talents are mind blowing. To then get their A game recorded for posterity becomes a remarkable achievement, and one that you would struggle to imagine being repeated so readily these days. (That’s not to take away credit from the bands still recording and performing this way, nor indeed the Funk Brothers legendary services to Motown)- technology is a vexed issue in both music and wider society, on the one hand it lessens the effort and money required to achieve certain things but simultaneously robs us of the time we might have previously been able to spend honing those skills. We can still collaborate (as evidenced by this event for example), but it is now in a very different way than herding together musicians and instruments for a studio lock–in. Like Cosmic Boogie, I don’t hold religious convictions, but to me, his personal life should in no way bar Gaye from making social commentary, especially as he encapsulates the mood of the time so eloquently. Whilst I wouldn’t class this as a protest album per se, the themes largely deal with issues such as poverty, war, slavery, ecological recklessness, destruction and a popular one of the day, the struggle against ‘the man’. Indeed his own struggle with dark demons and inner turmoil probably provided the extra insight that make this such a special record, as ultimately what Gaye was crying out for was redemption. In trying to make sense of the World around him, we are left with ‘What’s Going On’, a piece of work that may not provide the answers, but certainly asked all the right questions. Indeed, the redemptive power of love, be it of a partner, children, or a higher power are what help make our time on earth more bearable, even if the artist struggled to find it in his own life & relationships. Listening to the whole album gives you the time to cultivate a deeper understanding/ appreciation of the music and the story behind it. You can pick up on the nuances so much more in this way, and in the hectic life we live in, it reminds us to spend more time with people that are important to us, doing things that matter to us and that we are inspired to do. Well done to Greg for forcing us to look deeper, it’s time well spent! I really looked forward to this whole event, I often sit and really do listen to music but to actually have a time and date planned was lovely, it was a date as such. My daughter was with me who is 20 and really only knows Marvin from the Mowtown music, she was pretty moved and said it made her listen and appreciate the details of the music, she experienced the lyrics as beautiful as well as the music. Myself personally I need to sit and listen again and again to this album, I was impressed by the level of musicianship involved that I hadn’t really ‘heard’ before. Thanks for a brilliant idea that brings people together to share a great experience,… the overall power of music. great album, marvin gaye is my fav artist of all time. have it on my ipod listen to it quite a lot, had a listen on sunday night and it still sounds brilliant to this day. Spending time with this familiar and beloved album, absorbing nuances often missed when playing it as a backdrop to other life events, I am reminded of rituals of my past; when I and my fellow teens would bring long-coveted albums home from the shelves of Probe, Quiggings, or Scene of the Crime, take them round to each others houses and sit in silence for the grand unveiling. The LP Owner became a Master of Ceremonies; gently easing the vinyl from its sleeve, holding it by its edges to remove all possiblity of scratches or prints, before dropping it deftly onto the turntable and slowly releasing the alchemic needle. Only when the needle reached the final groove would we emerge out of our trance – sometimes, to play the album again; sometimes, to argue and analyze; but mostly, to sit in silence for a while longer, caught in the echo of the artists dream and savouring the process and its meaning. Words would fail us often at these times, but our faces said it all….And when, eventually, we broke our silence – the words came out sharp and loud, and somehow quivering with meaning – The Word as spoken by one who knows, not by empty vessels. More than simply listening to an album, we stepped into the temple of its creators. This indeed was Living to Music – an instinctive ritual of joy and reverence for so many teenage enthusiasts, but which adulthood too easily shatters. Listening to music with such reverence was the beginning of a life-long passion for me, but it was a ritual that was rarely repeated. Even as a music journalist, reviewing an album, I would be thinking more about how to structure my piece and write something fresh than I would think about connecting deeply with the music, the artist, or the message – all of which would be considered either wet, sychophantic or downright freakish by my peers. So to do this – to take this time to reconnect with a lost ritual long dismissed as childish or simply forgotten about – was a deeply powerful experience, and I am very greateful that a chance book lent to Greg led to a synchronous conversation and the birth of this idea. And the emotive, searing album chosen by Greg for the inaugural LTM event couldn’t have been more perfect to reopen me to music in such a profound way. We are so often discouraged from taking time out to Just Be – let alone to ‘waste’ time just listening – and even less so to sit around ‘just listening’ in a group, then sharing our experiences.The temptation to talk, to comment, to have something more pressing to attend to, is always there, pushing us further and futher from our deep, present human experience. That might be what is so terrifying in meditation – just sitting, just breathing, just listening – with nothing to hide behind. And that is what Living to Music is about for me – human beings made present by music – together in a room,together across the world – united by the music and our experience of unified listening to share. For the record, all these wacky blog comments are actually getting posted by real people, getting paid to spam blogs by Amazon as part of their mechanical turk program. Yep, company x pays Amazon to get their website inserted into other peoples blogs… and Amazon pays people to actually do the blogging… Great business model.